Description: stains in carpet, removing cat urine odor completely, Carpet Granule odor control, dog kennel, garbage disposal odor removal, pet odors, pet urine, skunk odor control, dog kennel, garbage disposal odor removal, eliminating dog odors, pet odor or pet urine, dog kennel, eliminate skunk odor in house or on animal, best remedy for pet stains in carpet. “All critters large or small, whether they walk, fly, swim or crawl. All have odors, some strong or barely at all. Odorless products for odor and stain removal from carpet, hardwood floors, furniture, and cement. N.O.G.C. Pet Odor Elimination Kit has provided the solution to problems like urine odor and stains, blood stains, or stains associated with vomited cat hairballs, since 1985. Step 1. B.O.S.S. ™ always use N.O.G.C. (B.O.S.S.) ™ FIRST! Clean up as much waste as possible then spray B.O.S.S. ™ lightly over the affected area. 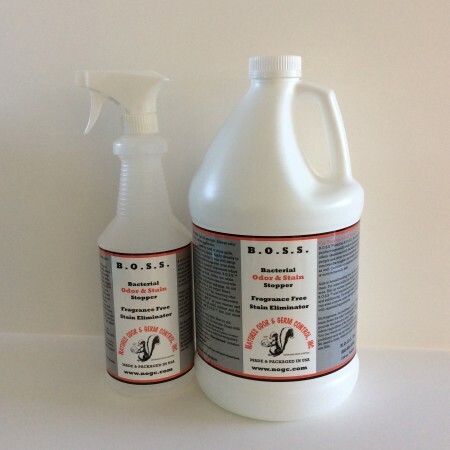 If you have a stain, spray and blot with a damp cloth to remove the stain, then spray B.O.S.S. ™ a few squirts at a time and scrub area with a damp cloth until stain is gone. NOT HARMFUL TO YOUR HANDS IN ANY WAY. This is an example of equal part measurements 1-quart N.O.C. ™ to 1 quart of water. In a new handheld sprayer. CAT PROBLEMS — 1 part of N.O.C. ™ to 2 parts warm (not hot) water. DOG PROBLEMS — 1 part of N.O.C. ™ to 5 parts warm (not hot) water. Thoroughly saturate the area (to reach the subfloor) extending about three times the size of the affected area. Let stand for 45 minutes to one hour. Then shampoo carpet with carpet cleaner as usual and be sure to rinse the area with extra water, then extract as much moisture as possible. Fans in the area always help to dry faster. Sprinkle carpet granules generously over the entire area and leave for 4 to 5 days (no longer than 7 days), then vacuum thoroughly. If any odor remains, repeat steps two and three. One 32 oz. jar covers 300 sq. ft. Note: it is important to keep pets from the area until all the granule has been vacuumed up, not because of harm to pet but because the odor will not be totally gone until that time and the pet may re-soil the area. You can always use a basket upside down over the area to keep pets away or position furniture to do the same. One Kit will treat approximately 300 square feet a 10 x 30-foot area. All products are totally safe around people, pets, and food. NOTE: Using more product does not make it work better! 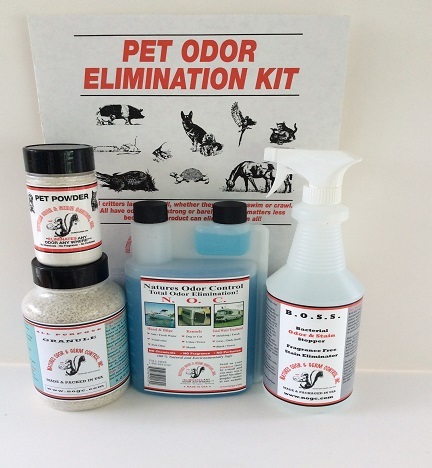 Pet Odor Elimination Kit contains 32 oz. of B.O.S.S., 32 oz. of N O C, 32oz. 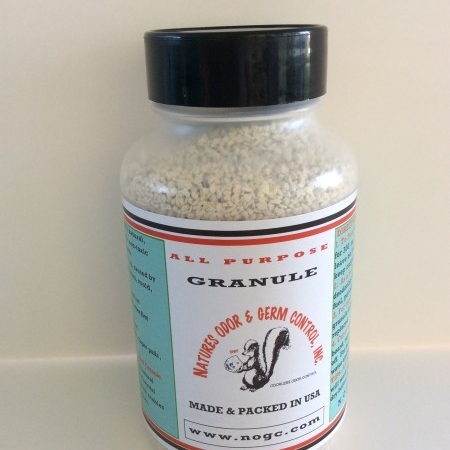 All-Purpose Granule and 8 oz. of N.O.G.C. All Natural Pet Powder, for odor, dogs in heat, healthy ears. I have used the Pet Odor Elimination Kit several times over the last year. Works very well…Took out the carpet stain and any odor from the same area. She never goes back to the same area, my little dog has not had any repeat offenses in that same area at all. Very simple to use and does the trick… Thanks to Sheryl’s personal phone help with selecting the correct product. Highly recommend NOGC…. Comments*: I have used these products for years and have cured some potentially serious pet odor problems. My sweet older dog had kidney failure for about a year and had multiple accidents. I used this product and my carpet remained as good as new. I also foster sick and very young cats and kittens for our local humane society. I have fostered several litters that were not potty trained, resulting in many accidents on the carpet. This product has kept my carpet in great condition with absolutely no odor or stains. I have also used the BOSS on my hardwood floors for cat accidents. With the larger containers it goes a long way and is very cost effective. I think this is the best product on the market for pet odors and stains. It really works! The shipment came on tuesday this week. Just today I’ve broken into them and began using them and I am beyond thrilled with results thus far! I am a Labrador Retriever breeder in central Pennsylvania and all of my dogs are house dogs, though they are routed in the house at different times of the day depending on the cycles of my girls!! My questions are now that I’ve seen the versatility and effectiveness of your products in action do you have any wholesale pricing available and do you allow other’s to carry/stock and sell your products? No matter the answers I am hooked and will be placing a follow-up order as soon as I can as the kit I purchased won’t come close to tackling everything I have planned now, but I had to be sure of the effectiveness before making a large purchase, I’m sure that’s understandable. Thank you so much for a safe and natural product that works so well!! I couldn’t be happier!! PS my main reason for purchase is to clean the outdoor deck in the dog yard before I seal it at the end of the season, though I didn’t see wood listed specifically anywhere I assume the BOSS and NOC are able to be used in that context. Not only do some of the dogs use the deck as their potty (regardless of their being real yard and stone area), I know there are also some mold/mildew issues that need addressed before they become a health issue for me or my dogs. Again thank you for your time! Have a wonderful weekend! I have been using Natures Odor and Germ Control for over four years now and I think your products are just wonderful. After moving to our home in Longview with brand new carpet in it, I started noticing a bad odor coming from the kids bedroom. By this time I had a real big problem. My youngest won would sleep walk and was urinating in the bedroom, not in one spot but different ones each time. By this time not only was it smelling but the carpet had stains also. After trying many different methods to try to get rid of the smell and stains and nothing was working; I thought the carpet might need to be replaced; my husband didn’t like the sound of that. The kids and I were at the Clark County Fair, we go every year, and we came across this both in the commercial building that sold N.O.G.C. products. These people showed me some things the products could do and I knew if it worked at home as well as it worked there this would make me real happy. I’m so pleased to say the stains and the smell are gone. I’m so thankful for N.O.G.C. products. My son stopped sleep walking after a lot of prayer and patience and I thank the Lord for that. I’m now using the refrigerator packs and they work great too. I ordered the Pet Kit which contained: Zeolite Carpet Granules, B.O.S.S. (Bacterial Odor Stain Stopper), N.O.C. (Natures Odor Control), and Pet Powder, following a trial and error dog adoption from the Humane Society. Our dog had a bad habit of going to the bathroom exclusively on our family-room rug. We adjusted the dog’s roaming area to stop this behavior, but the odor was unbearable until we used N.O.G.C.’s products according to their instructions. I was amazed at the absence of the horrible pet odor after only one application of these products. I never had to do a second application for this problem although I was advised to do so. I can honestly give my wholehearted recommendation of these products and of the excellent customer service provided by N.O.G.C.’s knowledgeable staff to anyone in need of odor control.